Next on the agenda was a visit to the Church of St John the Baptist at Ein Kerem. “Ein Kerem” translates to “the spring of the vineyard,” and is a small village south-west of Jerusalem. The main feature of the church is the Grotto of the Benedictus, which is said to be part of the home of Zechariah and Elizabeth and the birthplace of John. The thing that struck me most about the interior of the church was the many blue tiles on the walls – they kind of reminded me of delftware. Like so many churches in the Holy Land, this one is built on top of the remains and foundations of significantly older Byzantine and Crusader churches. The Benedictus (the song of Zechariah found in Luke 1:68–79) is displayed on ceramic tiles in 24 languages on the walls around gardens. Its name comes from its first words in Latin (Benedictus Dominus Deus Israhel, “Blessed be the Lord God of Israel”. The Israel Museum was our next stop where there is a large and impressive model of Jerusalem. Our guide Shafiq told us to think of it as Jerusalem on the eve of its destruction 70 AD. 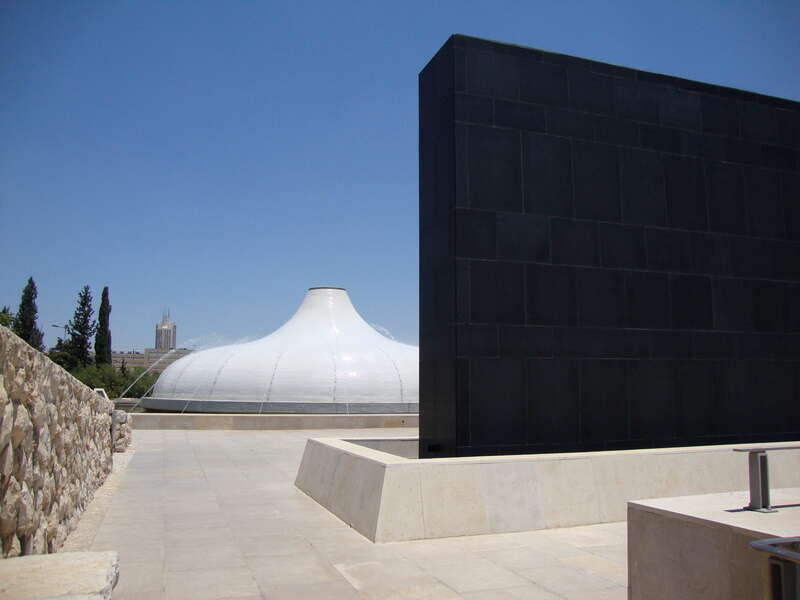 This is also where the Dead Sea Scrolls are housed, in the Shrine of the Book; a distinctive building the roof of which was designed to resemble the jar covers in which the Dead Sea Scrolls were discovered in 1947, however, it is usually described as the building with the onion-shaped top. (I’m sure the architects must be chuffed!) Directly beneath the dome is an imposing showcase (shaped like a wooden Torah rod) containing a replica of the Isaiah Scroll (written c. 100 BC), comprised of 66 chapters on a 7 m (23 ft) long, sewn-together piece of parchment. Apart from the scrolls there are also various religious objects from Jewish communities throughout the world, as well as the 10th-century Aleppo Codex, which is the oldest complete Bible in Hebrew. There was much more to see, but alas not enough time – our lunch slot was booked. After lunch we drove to Bethany where we visited the Church of St Lazarus, which stands among the ruins of three earlier churches. We did not have time to visit the tomb, which is further along the road and accessed via steps down to a shaft, as we had arranged to visit some nearby children’s homes. As I said before, these visits to see the people of the area, had a big impact, and in effect dominated my memory of the day. (See blog entry for 23rd June).